Lydia Bailey was a force to be reckoned with. For more than 50 years she owned and operated one of Philadelphia's best print shops. She hired and supervised more than 160 (male) printers during her career. Lydia was America's most productive 19th century woman printer. 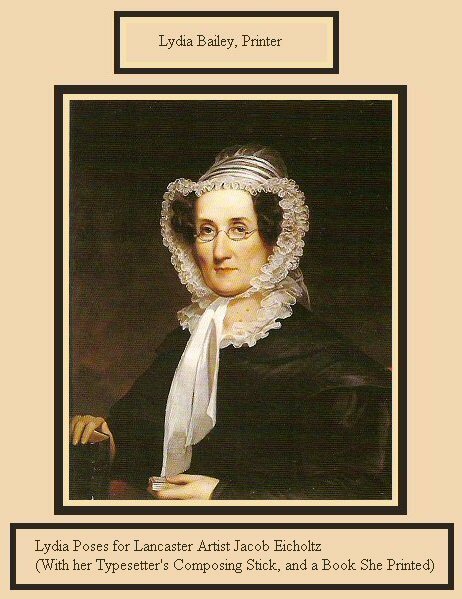 Lydia Bailey was a native of Lancaster County, PA. She was born Lydia Steele in 1779, in Drumore Township. Her parents were William Steele (1750 - 1847) and Elizabeth Bailey (1754 - 1826). This well-established Presbyterian family lived at Chestnut Level, near Peach Bottom, Lancaster County. When Lydia was 19, she married her cousin Robert Bailey, who was the son of Lancaster printer Francis Bailey ....so Lydia was Francis Bailey's daughter-in-law. Lydia's husband, Robert Bailey, was a printer in Lancaster and Philadelphia. When her husband died, Lydia took charge of his print shop, where she learned to set type, in order to provide for her four children, and to pay off her late husband's debts. Lydia quickly became one of Philadelphia's best printers. She was appointed the City Printer of Philadelphia, and was the only woman ever to hold that position. Lydia ran one of Philly's largest print shops. 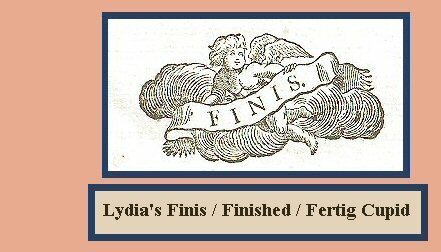 For more than 50 years Lydia printed books, almanancs, pamphlets, and business forms in Philadelphia (1808 to 1861). She was one of Philly's busiest job printers, and printed for most every publisher in town. More than 800 Lydia Bailey imprints are known. When printer Francis Bailey died in 1815 (Lydia's father-in-law), Lydia took charge of his printing business, in Philadelphia and in Lancaster County. Lydia was assisted by her son Robert William Bailey, until his death in 1861. Lydia retired that same year, at age 82. Lydia Bailey is featured online at Princeton University, Here. Old Sturbridge Village discusses Lydia Bailey and other Early American women printers, Here. ...and William J. Gilmore-Lehne of Stockton University discusses Lydia and women printers, Here. Pennsylvania's best Lydia Bailey collections are in Philadelphia, at the Historical Society of Pennsylvania and at the Library Company. You can search their catalogs for Lydia Bailey imprints Here . Lydia Bailey was a hands-on printer. Somewhere along the line, she learned to set type. She knew her way around a type case, and eventually became the most successful woman printer in 19th century America. Approximately two years after Lydia's wedding, her husband Robert Bailey and her father-in-law Francis Bailey printed numerous publications here in Lancaster, in 1800, including official reports for Pennsylvania's state government. Many women have been un-named partners in their familys' print shops. Wives often set type, while their husbands worked the presses. In 1804, Lydia Bailey's husband Robert printed several books here in Lancaster. By this time, his father-in-law Francis was no longer listed as co-printer. Also by this time, Lydia probably was helping her husband set type. 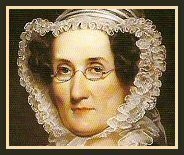 When Lydia's husband Robert died a few years later, in 1808, Lydia immediately took over the business in Philadelphia. She soon became the most productive women printer in 19th century America. Lancaster had given her a good head start. P.S. This Latin textbook was edited and proofread by three professors at Lancaster's Franklin College, today's Franklin and Marshall College: George Ross, Dr. Henry Muhlenberg, and Dr. C. L. Becker. 19th century stockholder reports can be numbingly boring. Or you can choose to call them "interesting." I call this report interesting, because the report is printed by Lydia Bailey ...and because canals actually are interesting. This 1828 report is the first stockholders' report of the company that created the Union Canal, a towpath canal that connected Middletown, on the Susquehanna River, with Reading, on the Schuylkill River. This canal was the "Golden Link" for shipping lumber and coal to Philadelphia. It followed the Swatara Creek past Lebanon and Myerstown. Today, the Union Canal Tunnel, in Lebanon County, is the oldest existing American transportation tunnel. It is Here. Above: This printed receipt doesn't really belong on this Lydia Bailey page, because she didn't print it. But the printer is anonymous, and I like the towpath cut, so here it is. 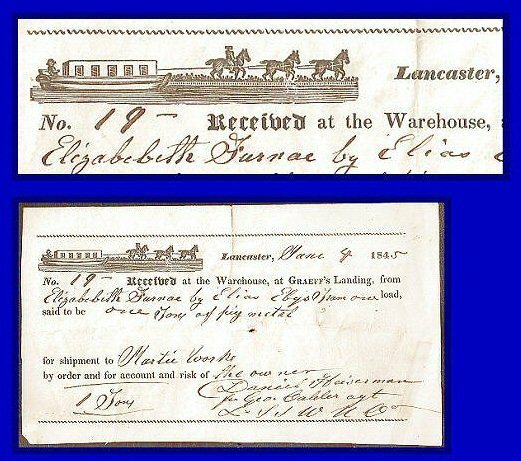 This is an 1845 receipt for hauling pig iron from Elizabeth Furnace in Brickerville, Lancaster County, to the canal at Graeff's Landing, in the southern part of Lancaster City. This canal had been built 20 years earlier by the Conestoga Navigation Company, to connect Lancaster with the Susquehanna River at Safe Harbor.